As lessons in British history go, this musical can have few equals. In the space of a couple of hours, The Hired Man takes us through the turmoil of gentry farmers hiring cheap labour, the perils of working down mines when profit came before safety, the resulting development of a miner's union, and, of course, the First World War. The Hired Man began life as a 1969 novel by broadcaster Melvyn Bragg, who based it on the first half of his grandfather's life as he moved from menial farm worker to miner, with the 1914-18 conflict thrown in between. On Bragg's own admission, the story covers 25 years of working-class life, set in his grandfather's native Cumbria. But that did not prevent it from being turned into an award-winning musical when stage, film and TV composer Howard Goodall came onto the scene some years later. 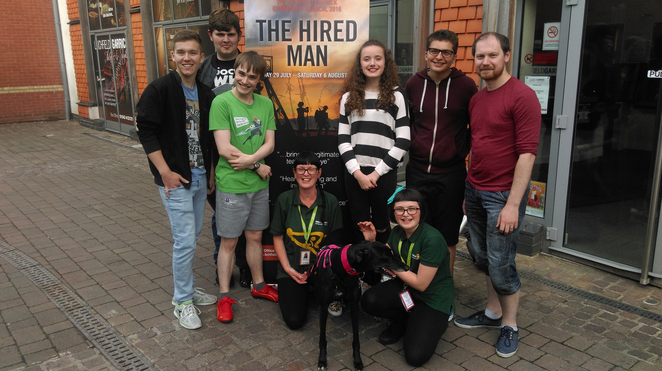 The Lichfield Garrick, which is staging The Hired Man from Friday 29 July to Saturday 6 August, decided to create its first ever community musical which resulted in local actors, singers and other amateur performers successfully coming through auditions to appear on stage alongside the theatre's professional cast and production team. There was even a special place for a six year old retired racing greyhound called Teddy, who made several appearances throughout the show. The Hired Man, directed by Lichfield Garrick's artistic director Tim Ford, follows the story of farm labourer turned coal miner John Tallentire and his wife Emily as they struggle to make a living from the land at the turn of the 20th century. It is grim watching at times, not surprisingly given the content matter, and at times it feels as though the story is racing along at too fast a speed with insufficient time for real character development. That said, Matt Bond and Megan Daniels are superb as central characters John and Emily, particularly when it comes to their splendid vocal talents. And the rest of the large cast perform so well that it is nigh on impossible to spot the community actors and singers from their professional colleagues on stage. The Hired Man continues at the Lichfield Garrick until Saturday 6 August with performances starting at 7.30pm each evening plus a 2.30pm matinee on Saturday. Tickets cost from £10 to £15, and can be booked online or by calling the Box Office on 01543 412121.